When a medium—which can be gas, liquid, solid, or free particle—is stimulated by an energy source in a controlled and methodical manner, the light emitted is of a single wavelength particular to the medium (ie, monochromatic) and is intense or high energy, coherent (travels in a constant phase in time and space), and collimated (travels in the same direction). Such properties enable the light beam to penetrate tissue in order to incise the tissue, seal blood vessels and nerves, and char and vaporize diseased tissue. The pattern of laser output may be continuous or pulsed. If the excitation is sustained for more than 0.1 second, a continuous beam of light is produced, and if the stimulation is interrupted at intervals of 0.05 to 0.5 seconds, a pulsed output occurs. Either of these modalities can be used, depending on the requirements of the surgical procedure. A pulsed laser delivers higher peak power, measured in joules (watts per second) than does a continuous wave laser, the energy of which is measured in watts. The high power densities of a pulsed laser produce nonthermal interactions with tissue, which is a useful adjunct to the primary purpose for which the laser is used (eg, in lithotripsy procedures). Q switch is a mechanism used to deliver a pulsed beam, and this provides energy at much higher densities and longer duration, but also with greater frequency, thus optimizing the laser output. Laser light interacts with tissue to cause thermal, chemical, or mechanical effects. The thermal effects of laser cutting, coagulation, and vaporization are made use of in the majority of laser applications at settings of 25 to 100 watts. The chemical uses of laser are seen in photodynamic therapy in which a photosensitizer drug concentrates in neoplastic tissue and is then activated with laser light to release free oxygen radicals that destroy the abnormal tissue. Photodynamic therapy, or phototherapy, can be administered topically or parenterally. The mechanical effects of laser are utilized in the removal of tattoos and in lithotripsy procedures (eg, the removal of salivary stones). All the above effects of laser are dependent on the type of laser used, as well as on the type of tissue, since a particular tissue may transmit, absorb, scatter or reflect the laser light. Transmission of energy does not have any effect on the tissue but can result in damage to deeper structures. The tendency of tissue to absorb laser energy determines the final effect of the laser. Different wavelengths are absorbed to various extents by different types of tissue, causing the tissue to disintegrate due to heat, chemical reaction, or mechanical disruption. Scattering of laser energy may result in collateral, nonthermal damage to surrounding tissue, while the reflection of a laser beam can lead to effects outside the body of the patient, as in airway fires and injury to operating room personnel. The thermal effects of laser, which occur at 60-65ºC, are the most commonly used. At these temperatures, protein denaturation occurs, along with disturbance of deeper structural integrity and visible blanching of the tissue. At 100ºC, vaporization of water inside the cells takes place, with vacuole formation, cratering, and tissue shrinkage occurring. Breakdown into elemental carbon, with formation of gas and smoke, occurs at temperatures of several hundred degrees Celsius. Immediately surrounding a laser-ablated tissue region is an area of heat necrosis in which small vessels, nerves and lymphatic channels are sealed; this is why there is a relative absence of bleeding, pain, and edema in laser-operated lesions. Over the long run, this also means that fibrosis and scarring are greatly reduced in laser wounds. Pulsed lasers, by virtue of the extremely brief periods with which they interact with tissue, cause less thermal damage, because the heat is not as readily absorbed into the surrounding areas. Comparative studies between wounds inflicted by laser and those made with cold steel have revealed that laser wounds initially suffer delayed healing and weakness of repair for up to 3 weeks, but that after a month, the wound results for laser and steel are indistinguishable. The second advantage of laser surgery is hemostasis, since the CO2 laser can coagulate vessels that are between 0.5 and 2 mm in diameter (although it is recommended that vessels of wider caliber, ie, 1-2 mm, be clamped and ligated). Other significant advantages of laser surgery are a great reduction in postsurgical swelling and a near absence of pain, due to sealing of lymphatics and nerves, respectively. Moreover, scarring is greatly reduced, and wounds heal without much complication. The disadvantages of laser surgery are mainly attributable to complications, which are discussed later in the article. Other relative drawbacks are the infrastructure required to provide laser surgery, which can push up treatment costs, and the steep learning curve that surgeons have to go through to achieve competence, and then mastery, of laser procedures. For all of the above, laser might be the preferred choice for surgery, provided that the surgeon has the skill and experience for handling this medium. Laser would definitely be indicated in cases in which hemostasis and prevention of postoperative edema are of the utmost concern, as in the treatment of vascular lesions. Pain relief is almost instantaneous and more sustained with laser, thus reducing the need for excessive medication. Therefore, another indication for laser use would be the presence of a medical comorbidity, such as asthma, renal impairment, or acid-peptic disease, that precludes or limits the prescription of painkillers. Although more relevant for cutaneous lesions, and not for otolaryngology, laser is also indicated in cases in which scarring is undesirable, since laser wounds heal almost without any scar formation. There are no contraindications specifically for laser surgery, except when surgical proficiency and safety are compromised. The usual contraindications for conventional surgery hold good for laser procedures, especially in the case of coagulopathies. Considerable time and effort go into setting up the laser equipment and ensuring safety, and this could be a bane when excessive bleeding is a distinct possibility. Even in the absence of a coagulation problem, laser surgery has not been conclusively proven to be superior to scalpel surgery. Lasers are potentially dangerous devices and may even cause fatal accidents. The manufacturing and distribution of medical lasers, because they are in class 4, are overseen in the United States by the US Food and Drug Administration (FDA). All institutions, professional bodies, and private practitioners are expected to conform to guidelines formulated by the American National Standards Institute (ANSI), published in the American National Standard for Safe Use of Lasers in Health Care Facilities. Any injury, major or minor, should be reported to the relevant Occupational Safety and Health Administration. All data regarding such injuries must be documented as accurately as possible. Laser vaporization of tissue understandably produces smoke, leading to environmental contamination, with CO2 lasers producing the maximum amount of smoke and neodymium:yttrium-aluminum-garnet (Nd:YAG) lasers producing much less. This smoke, or plume, has the typical odor of charred tissue that is bound to cause a degree of revulsion to anyone or everyone in the operating room and may even lead to somatic manifestations such as headache, nausea and lacrimation. The laser plume is also laden with biological elements such as deoxyribonucleic acid (DNA) and may theoretically lead to genetic mutations and neoplastic changes. Viral DNA from laryngeal papillomas, known to be caused by the human papillomavirus (HPV), have yet to be detected, although genital warts and condylomas caused by the same have yielded viral DNA. Noninfectious DNA from the human immunodeficiency virus (HIV) has also been found, and so also from bacterial spores. No tumor cell DNA has yet been isolated from a laser plume. Thus, while it is possible that the laser plume can cause disease transmission, no case has been documented so far. Much of the plume can be removed with a smoke evacuator, but some still remains suspended in the air and may be avoided with the use of face masks capable of filtering ultramicroscopic particles. These masks should be fresh and dry in order to function optimally. The high-energy concentration of a laser beam may lead to perforation of viscus or blood vessels. Large vessels (greater than 5 mm) cannot be coagulated with a laser, so conventional ligation has to be done. Potentially fatal complications such as pneumothorax have occurred, and strict vigilance is required in the intraoperative, perioperative, and postoperative stages. The gas coolant used with lasers has been reported to have caused lethal embolism into the venous circulation, especially with the Nd:YAG laser (although it has also happened, very rarely, with the CO2 laser). Saline as a coolant is advised when using a laser in body cavities, but this has the other undesirable effect of causing a fluid overload. Fortunately, these problems are hardly encountered in the vaporization of mouth lesions with the CO2 laser. Nevertheless, continuous and careful monitoring of the airway and blood gases is mandatory during the use of CO2 laser with general anaesthesia, to promptly detect and treat any incidence of embolization and hypercapnia. In the event of an airway fire, ventilation must be suspended, the affected material removed as quickly and carefully as possible, and jet ventilation and oxygenation with mask instituted. Conventional surgery may be performed to complete the procedure, and in the event of considerable upper airway injury, a low tracheotomy may have to be done. In more serious cases, critical care with mechanical ventilation might be necessary. Safety glasses with optical properties compatible with the laser being used must be worn by the patient and the operating surgeon, as well as by the rest of the operating room personnel. This is important for visible lasers, such as the argon and potassium titanyl phosphate (KTP) lasers, in which the laser beam is not absorbed by the ocular fluids and can traverse the globe to cause a retinal burn. Tinted glasses, which may have to be used with these lasers, may cause difficulties during surgery, because they somewhat obscure tissue color characteristics. Moreover, the glasses must have a wraparound design so that lateral or tangential entry of the laser light beam is preempted. The energy beam from a CO2 laser is easily absorbed by the water-rich tissues of the eyeball and can result in a burn and in subsequent scarring of the cornea and lens. Ordinary glass or plastic lenses are adequate for the CO2 laser; glass is more protective for the wearer but more threatening for the other staff, since glass tends to reflect the laser beam somewhat. The patient is strictly instructed to keep his or her eyes closed, and then protective glasses are worn, over which wet cotton or gauze pads are placed. Hair must be tied snugly back and covered with a cap to prevent it from accidentally catching fire. Surgical instruments should be blackened or ebonized and have roughened metallic surfaces as far as possible. They should be lightweight and easy to manipulate, especially if a smoke evacuator is attached to the instrument. Handheld instruments must have a backstop to control the delivery of the laser beam; the backstop should be prevented from overheating in case the continuous mode of delivery is used. Routine surgical instruments and equipment must be kept on standby in case of untoward failure of the laser. Electrocautery and silver nitrate must be available to control minor bleeding, if any, in case of laser nonfunction. Saline-saturated cottonoids, nonflammable drapes, laser suction platforms, smoke detectors, and fire extinguishers must be kept in close reach. A basin containing water must be kept in an easily accessible area to douse a flaming endotracheal tube, cottonoid, or drape. Moreover, the laser equipment must have a master switch operated by a key that is always under the control of a chief surgeon or supervisor who is well-versed with the workings of the system. Flammable liquids, such as alcohol, acetone, and ethyl chloride, which are otherwise commonly available in the operating room, must strictly be removed from the room when using laser. The presence or use of rubber and plastic should be minimized. Electrical and plumbing circuits must be foolproof and constantly maintained at high standards of performance. Enough space must exist around the equipment for easy and unhindered movements of the operating room staff. The room windows must be shaded or covered with dark blinds that can absorb stray beams of reflected laser light. The room door(s) must be closed and locked to prevent entry of unauthorized persons. Additionally, prominent signage must be displayed outside stating the class, type, and wavelength of the laser being used. The sign used may be removable with Velcro strips or metal hooks. A flashing red light over the operating room entrance may be additionally used when the laser procedure is in progress. All surgical lasers, except the low-power diode laser and the aiming helium-neon laser, belong to class 4. 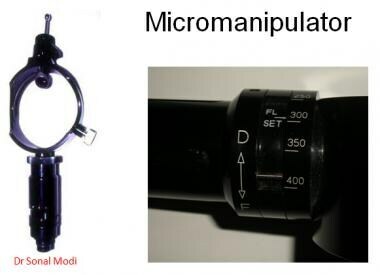 This means that the power output (more than 500 mW) is capable of causing eye and skin burns even without direct or magnified viewing. The coaxial helium-neon aiming-beam laser with a wavelength of 0.633 nm (ie, in the visible [red] region) is used with both the CO2 laser and Nd:YAG laser, as the wavelengths of both these lasers fall in the invisible part of the spectrum. Laser surgery of the mouth can be performed under either local or general anesthesia. The patient is positioned for such surgery as he or she would be for a conventional operation. For local anesthesia, the procedure followed is same as that for conventional cold steel surgery, with hypersensitivity testing and with topical application or infiltration of the anesthetic. The size and accessibility of the lesion and patient cooperation and consent are taken into account. Local anesthesia is usually employed for small or moderately sized lesions, especially for biopsy purposes. 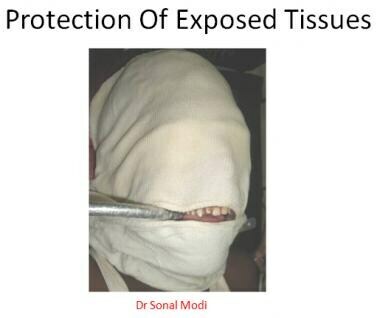 A majority of dental procedures, such as epulide or granuloma removal, as well as vaporization of aphthous ulcers and areas of lichen planus, involve the use of local anesthesia as the sole method of analgesia. Sedation is usually not required in these cases. Partial glossectomy, tongue release, and treatment of hemangiomas or lymphangiomas require the use of local anesthesia with sedation or, preferably, the use of general anesthesia; tonsillectomy and uvulopalatopharyngoplasty require the use of general anesthesia only. Special protocol is followed when general anesthesia is administered for laser surgery. Apart from the usual safety precautions, specialized anesthetic gear is used. This includes mainly endotracheal tubes made up of highly reflective material that can offset the accidental impact of the laser light beam. If an ordinary rubber or silicone tube is used, it must be systematically wrapped with metallized foil by winding the gauze around the tube. An endotracheal tube with double cuffs is used and the cuffs are filled with saline, with the upper cuff specifically filled by saline colored with methylene blue to indicate an early leak. The saline also helps to douse any minor airway fire before any deeper airway injury can take place. Options include the use of jet ventilation techniques or apneic technique with periodic intubation of the airway, but these are to be done by highly skilled and experienced anesthesia staff. Also, the anesthetic gases used are tailored to cause the least chance of an airway fire. A mixture of helium, nitrogen, and room air with oxygen is recommended. The most dangerous combination from the point of view of causing an airway fire is a mixture of oxygen and nitrous oxide. For oral or oropharyngeal surgery the patient is placed in slightly head-low (Trendelenburg) position with appropriate extension of the neck and head, depending on the area or lesion accessed. The surgeon is either to the right or at the head of the patient. Any assisting surgeon or nurse is on the opposite side. The anesthetist usually occupies a position midway between these 2; that is, he or she is at the head end when the surgeon is operating from the right, and when the surgeon is at the head end, the anesthetist may be either to the left or right, according to individual convenience. The anesthesia trolley, Boyle’s apparatus, and any additional anesthesia equipment are directly accessible to the anesthetist and so are positioned on the same side as the anesthetist. The patient’s arm on the side of the surgeon is kept in extended position and tucked snugly under the patient’s body or strapped to it. The opposite arm is outstretched on an armrest and is employed for intravenous access and monitoring. The patient’s head rests on a soft to firm rubber ring suitable for the head size. A sandbag or small pillow is used for neck extension, and additional linen rolls may be placed on the side of the patient’s head for finer adjustment and comfort. The assisting nurse is stationed close to the surgeon, preferably to the right for a right-handed surgeon, and the instrument trolley must be clearly visible and thoroughly familiar to the surgeon and to the assisting nurse, apart from being equally and easily accessible to both. The trolley(s) must be meticulously checked by the chief and assisting surgeon and nurse prior to inducing and draping the patient. All equipment and implements essential for laser surgery, as well as for conventional surgery, and the readiness of the operating room personnel, must be ensured at the beginning of induction. Intermediate-term monitoring includes being alert to the possibility of infection, particularly because laser wounds take comparatively longer to heal than scalpel wounds. Attention should be paid to prophylactic medication, protection of the wound from injury or contamination, and good nutrition. The technique of laser surgery largely depends on the type of laser used and the method of delivery. Lasers commonly employed in the vaporization of mouth lesions include CO2, KTP, Nd:YAG, erbium:YAG, and diode lasers. A flash scanner can spread laser energy more uniformly over a target area, for example over 3 mm in 1 microsecond, by using a system of 2 nearly parallel mirrors rotating across each other at extremely high speeds. This type of laser causes no charring and is used for the removal of tattoos and wrinkles, recontouring the vermillion border in leukoplakia, and surface ablation of tonsillar crypts. SwiftLase is a flash scanner laser combined with a power output of 30 watts in a handpiece that is used extensively for laser-assisted uvuloplasty (LAUP) and tonsillar cryptolysis that is fast, painless and bloodless. The preferred laser by far for use in the oral cavity is the CO2 laser, although dentists use the erbium:YAG laser for aphthous ulcers, lichen planus, epulides, and granulomas. 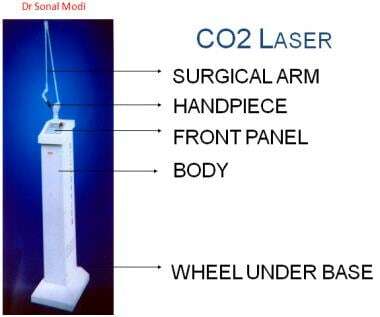 The handheld or freehand CO2 laser is used exactly like a cold steel scalpel for surgery, and all other instrumentation remains the same as for cold steel, barring the special safety and anaesthesia requirements that are mandatory for laser. By altering and adjusting the power (watts), exposure time (seconds), and spot size (mm), the freehand CO2 laser is used for incising, dissecting, and vaporizing abnormal tissue. Laser plume and bleeding are evacuated by suction, and dry or wet mops are used wherever necessary, as in conventional surgery. The thermal damage to collateral tissue is minimized by optimal adjustment of the power, exposure time, and spot size and by precise and expert handling. Power and spot size are inversely proportional to each other, whereas power delivered to a lesion increases in direct relation to the time or duration of exposure. Power density (the total energy on a spot size) can be altered by using lenses to focus the laser light beam and by working within the focal point of the lens system for the highest power density, which would provide the smallest spot size. Likewise, the beam can be defocused, thereby increasing the working distance, in order to increase the spot size and reduce the power density. Transverse electromagnetic mode (TEM), a setting that is specific to the laser being used, is a feature of the laser beam that determines the beam's energy distribution. The CO2 laser is TEM alpha, meaning that it concentrates the beam at the center. Therefore, as the handheld laser is brought closer to the lesion, the spot size increases and greater thermal energy is delivered, thus increasing the efficiency. This would also cause more collateral thermal injury; hence the mode of delivery should be pulsed. Power delivery should be set for the highest safe level, so that incision margins are clean and ablation is precise, with very minimal or absent tissue charring and thermal injury. The treated area does not require any special postoperative care. Needless to say, suturing, tamponade, graft cover, or dressing is unnecessary in laser surgery. In fact, the wound is kept raw and uncovered, because there is good hemostasis and minimal or no edema. However, observation for up to 6 hours is required to ensure the absence of complications. Observation must be continued for up to a week following procedures with an Nd:YAG laser, because swelling and sloughing of tissue can occur at deeper planes and are manifested when the superficial layers appear to have healed. Intravenous fluids and nasogastric feeding are usually not required and most mouth lesions can be treated in an ambulatory setting with laser. Complications, such as infection and hemorrhage, can occur with laser surgery, although less so than with conventional surgery. While the heat energy generated by lasers is sufficient to destroy microbes in the surgical field, the relative absence or paucity of fibroblastic repair due to sealing of vessels and lymphatics leaves a raw area that heals more slowly than a scalpel wound, making it vulnerable to contamination in the postsurgical period. Thus, although there is no special postprocedure care in the nature of wound dressing, cleaning, or application of topical medication, vigilance is a must to watch out for bleeding, edema and airway problems for at least up to 6 hours. Moreover, maintenance of the patient’s medical and nutritional status is of the utmost importance. Laser does not coagulate vessels of more than 5 mm in caliber, and it is advisable not to use laser for coagulation even for vessels as small as 1-2mm. For vessels of these calibers, conventional ligation is preferred. If these larger vessels are sealed with laser, the risk of postoperative bleeding remains high and can lead to serious problems. Airway fire, if any has occurred, can have damaging effects on the larynx, trachea, and esophagus, can lead to fatal hemorrhage and pneumothorax on the table, and can cause soft tissue injury that results in neck space infections. Burns to the eyes and skin can range from the minor to the very serious, leading to blindness and scarring. The importance of protective measures to shield the patient and operating room personnel cannot be overemphasized. Preoperative medication remains the same as for conventional surgery. Medication provided after laser surgery is minimal. Analgesics are usually required, albeit in smaller doses and for shorter duration. Prophylactic medication, such as antibiotics, may be prescribed, depending on the patient profile (eg, the possibility of nutritional neglect, the likelihood of poor follow-up, the chances of contamination). All other medication that the patient may be taking for any medical comorbidity, such as diabetes or hypertension, may be continued as usual. Jha N, Ryu JJ, Wahab R, Al-Khedhairy AA, Choi EH, Kaushik NK. Treatment of oral hyperpigmentation and gummy smile using lasers and role of plasma as a novel treatment technique in dentistry: An introductory review. Oncotarget. 2017 Mar 21. 8 (12):20496-20509. [Medline]. [Full Text]. De Souza TO, Martins MA, Bussadori SK, et al. Clinical evaluation of low-level laser treatment for recurring aphthous stomatitis. Photomed Laser Surg. 2010 Oct. 28 Suppl 2:S85-8. [Medline]. Aggarwal H, Singh MP, Nahar P, Mathur H, Gv S. Efficacy of low-level laser therapy in treatment of recurrent aphthous ulcers - a sham controlled, split mouth follow up study. J Clin Diagn Res. 2014 Feb. 8(2):218-21. [Medline]. [Full Text]. Hamadah O, Thomson PJ. Factors affecting carbon dioxide laser treatment for oral precancer: a patient cohort study. Lasers Surg Med. 2009 Jan. 41(1):17-25. [Medline]. Suter VG, Altermatt HJ, Sendi P, et al. CO2 and diode laser for excisional biopsies of oral mucosal lesions. A pilot study evaluating clinical and histopathological parameters. Schweiz Monatsschr Zahnmed. 2010. 120(8):664-71. [Medline]. Santos NR, Aciole GT, Marchionni AM, et al. A feasible procedure in dental practice: the treatment of oral dysplastic hyperkeratotic lesions of the oral cavity with the CO2 laser. Photomed Laser Surg. 2010 Oct. 28 Suppl 2:S121-6. [Medline]. Monteiro L, Barbieri C, Warnakulasuriya S, Martins M, Salazar F, Pacheco JJ, et al. Type of surgical treatment and recurrence of oral leukoplakia: A retrospective clinical study. Med Oral Patol Oral Cir Bucal. 2017 Sep 1. 22 (5):e520-e526. [Medline]. [Full Text]. Simoes A, de Freitas PM, Bello-Silva MS, et al. Laser phototherapy for Stevens-Johnson syndrome: a case report. Photomed Laser Surg. 2011 Jan. 29(1):67-9. [Medline]. American National Standard for Safe Use of Lasers in Health Care Facilities. 2005. Cloitre A, Rosa RW, Arrive E, Fricain JC. Outcome of CO2 laser vaporization for oral potentially malignant disorders treatment. Med Oral Patol Oral Cir Bucal. 2018 Mar 1. 23 (2):e237-e247. [Medline]. Deppe H, Mücke T, Hohlweg-Majert B, Hauck W, Wagenpfeil S, Hölzle F. Different CO2 laser vaporization protocols for the therapy of oral precancerous lesions and precancerous conditions: a 10-year follow-up. Lasers Med Sci. 2012 Jan. 27(1):59-63. [Medline]. The author and editors would like to thank Dr. Sonal Modi for all images provided for this article.